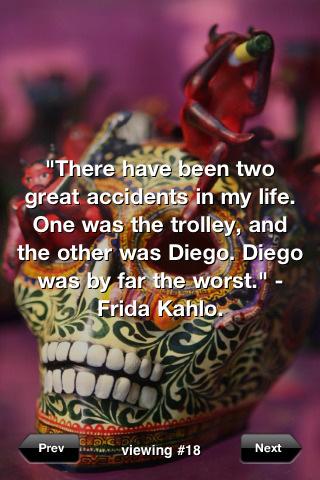 Read through this and other notably honest and touching quotes from Mexican Surrealism icon Frida Kahlo presented in the Frida K iPhone app. Remember Frida’s spirit, her passion, and her zest for life, art, and love. Quotes are laid on top of a beautiful mosaic skull art piece. There aren’t many to go through here, only 20 quotes. There are also ads in the app, not to mention spelling and grammar errors. It would be great if more backgrounds and quotes were added. But for a quick download/delete free app, this is worth checking out, especially today, given it is Frida’s birthday. Viva La Frida. AppSafari review of Frida K was written by Joe Seifi on July 6th, 2010 and categorized under App Store, Art. Page viewed 4389 times, 1 so far today. Need help on using these apps? Please read the Help Page.